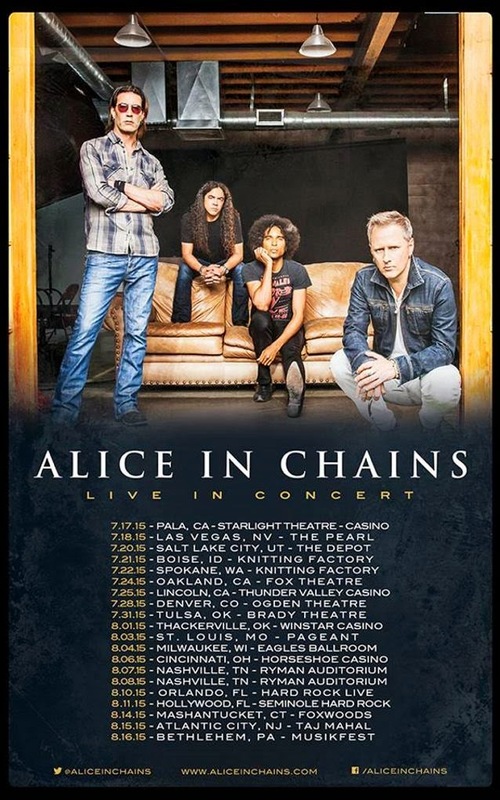 ALICE IN CHAINS has announced a headlining U.S. summer tour, set to kick off July 17 at the Starlight Theatre at Pala Casino Spa & Resort in San Diego, California. Ticket pre-sales will be donating two dollars for every pre-sold ticket to a memorial fundraiser. "Thanks to the great people at WMRQ in Hartford, Connecticut, we became close with a young man named Stefan Dayne-Ankle, who sadly last week lost a courageous battle with leukemia," says the band. "To honor Stefan and help give him the memorial he deserves, we're donating $2 from every ticket pre-sold on this tour." You can read more about Stefan's story, and why the band is raising funds for his family, by clicking HERE. 07/18 – The Pearl @ Las Vegas, Nev.
07/22 – Knitting Factory @Spokane, Wash.